What does Framing Depth mean? Framing depth measures the distance from a pet door’s inside frame to the outside frame. Many doors are constructed to fit a regular household door. That means, the pet door will frame the hole through the door, giving a professional appearance. If a pet door were to have a frame depth of 0, it would screw flat on the surface and have no self framing tunnel between the inside and outside at all. 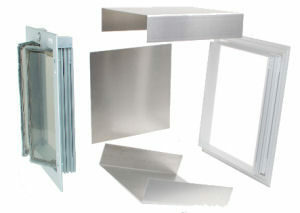 Pet door kits intended for wall installations usually frame up to 12 inches. If the wall is thicker than 12 inches, your pet door installer can help you find a solution. The image shows an example of a PlexiDor wall tunnel kit. The door itself sits on the inside of the wall – so you have easy access to the key. The pieces in the middle of the image are used to frame the inside of the wall. Note that the tunnel slopes, to keep water and snow outside the house. To the far right on the image is the outside frame.